Don’t worry, we haven't gone far. We are now located just next to the priory, in The Little Dairy Shop. If you drive into Binham Priory car park, you will see our signs. We now have an additional vending machine selling local cheese and butter, You will also be able to help yourself to a takeaway coffee, made from Abbey Farm Dairy Raw Milk. There will be plenty of parking space and there will be tables to sit at if you want to drink your coffee and admire the lovely view of the beautiful Priory. We would be very grateful for any suggestions that you may have, either by writing it in our book or giving us a ring - 07776232440. You can see photos of the new shop being built on Instagram @abbeyfarmdairy. Welcome to our website. 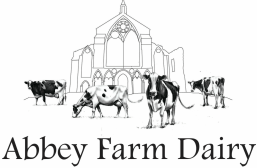 Here you can find all you need to know about Abbey Farm Dairy and the raw milk that we produce and sell on the farm. We love our milk and we want everyone to have the opportunity to try and benefit from some of the creamiest and freshest milk in North Norfolk. 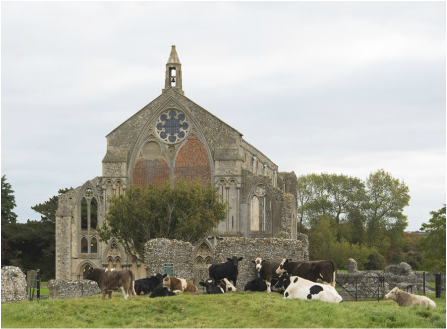 Our raw milk is now being sold at The Little Dairy Shop, just up the road from its previous location, just next to Binham Priory. The Dairy is situated in the picturesque, flint walled village of Binham, North Norfolk. The Dairy is home to a herd of over 100 Pedigree Holstein Friesian Cows. They graze the lush meadows in and around the village, some of which surround the beautiful village priory. In addition Binham has a Village shop with petrol station and pub which is just 10 minutes drive from the North Norfolk coastline. The farm is owned by William and Alex Wales. Most of William's time is split between looking after the cows and growing crops on the remaining land. Alex runs their holiday cottage business and looks after the rest of the farm animals. ​Andy is the Dairy Cowman and knows the cows better than anyone else. He makes sure that they are kept happy and healthy and milks them twice a day.